So it’s the last camping weekend before we have to close up the camper and since we are planning on buying a new one in February not only does it need to be winterized, but also completely cleaned out and ready to sell. In order to winterize, you need access to water, sewage, and power so we went back to Swanzey Lake Campground for out third visit. While we were hanging out and relaxing, we realized this was definitely the location that we wanted to try as a seasonal camper. Seasonal campers buy a year-long pass and stay in the same site, which eliminates the need for the constant tear down and set up of the camper…a huge plus!! Also, you don’t have to pay for storage through the summer months because you keep the camper at the campgrounds. We had the opportunity to stay at 13 different places this summer (more activity in a summer than we have ever had in our married lives:) ) and it’s funny that we actually came full circle. 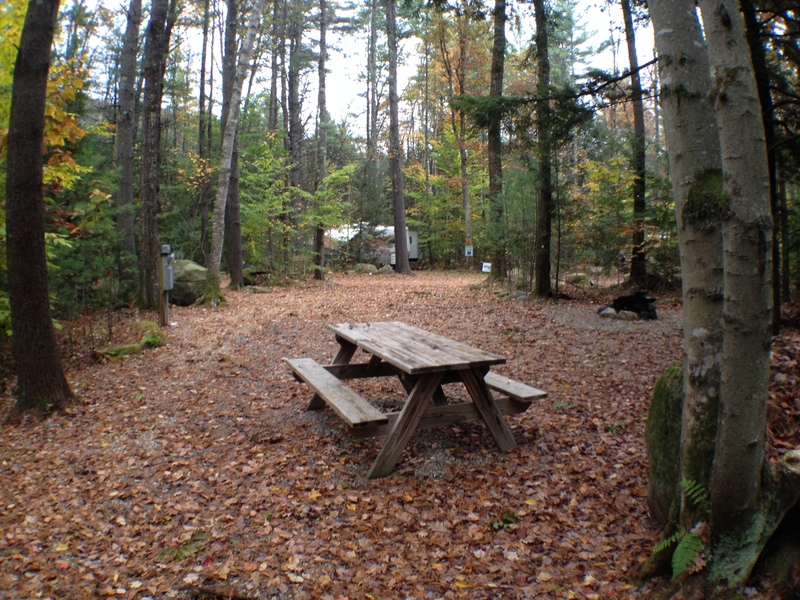 We booked a seasonal site at the very first place we camped at, Swanzey lake Campground. Although it wasn’t either of our overall favorite for the year (mine was Tree Farm Campground and Lee’s was Oxbow Campground), it is the closest to our house and offers a little bit of everything…wooded sites, a lake, a beach. Plus the folks here have been very helpful to us newbies. Lee went to the office to get a packet and found out there were only 4 available seasonal sites left…yikes!! We walked around to see them and luckily one of my favorite n sites 102 was on the list. Sold!! I am particularly fond of the big rock at the back of the site. So this is our new camping home for 2014. The cost for a seasonal site is $2700 from April 15th – Nov 1st which is pricey, but in New England they are all pretty expensive so it is in line with prices we got from other campgrounds and still way cheaper than a one week vacation. One thing that was very interesting was as soon as Lee paid the deposit, the entire campsite experience changed. The women at the office/store started introducing him to other seasonals and the security lady, Vicky, who drives around and keeps an eye on things, stopped by and introduced herself. Apparently there are lots of activities for seasonals only…who knew. Definitely going to be a different experience and I am looking forward to trying it out. It’s sad that we are done, but what a terrific summer. We camped for over 40 days in New York, New Hampshire, Vermont, Illinois, Wisconsin, Pennsylvania, and Indiana. We bought our first RV, went to our first RV show, and picked out our second RV. We bought our first truck and have picked out our second, a diesel. We stayed at a farm, a casino, and on the ocean. We took a magical hike, tried tons of new recipes, and learned so much, not the least of which was how much we enjoyed each others company. It was a great time and I can’t wait until next year to see where the journey takes us. You won’t be hearing much from us until February when we start the process of buying our Open Range, so talk to you in the spring. Put Bounce Dryer sheets EVERYWHERE. This entry was posted in Uncategorized and tagged newbie campers, seasonal site selection, Swanzey Lake Campground, winterizing the camper. Bookmark the permalink. Glad I came across your blog. We will be headed out FT next summer and we can’t wait. We hope to meet you at the RV Dreams rally in TN in April! Thanks for taking the time to read it!!! Look forward to meeting you as well. That’s an oldie. Wasn’t sure what you meant ? ?